The village of Cloughmills in County Antrim, in Northern Ireland, has a small model replica of their village displayed in their village hall. But unlike many miniature models, theirs is made of wool. 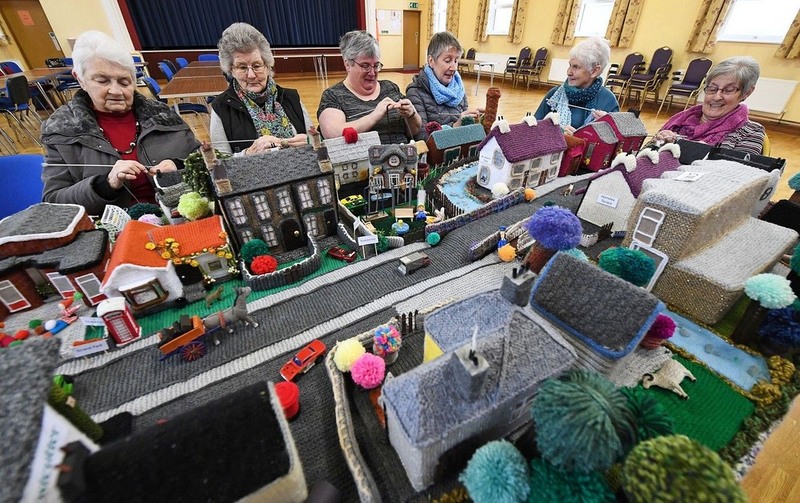 The model was created over a period of seven months and completed in 2017 by a group of about thirty old ladies—all members of the Cloughmills Crochet Club. The club was founded by May Aitcheson about seven years ago to help elderly people socialize and at the same time develop crafting skills. Several years ago, Aitcheson went to Cushendall, a similarly sized place located some 15 miles away, and saw a model village there that inspired her to make a model of Cloughmills. “But ours snowballed,” she told BBC. The ladies went out and photographed the different buildings in the area, and then began to craft the houses, first with cereal boxes which they covered with the crochet. They even created a few sites that no longer exist, including the old shirt factory where many of the members once worked. “People did more and more and by the time they all got added on, ours ended up very big,” she said. Eventually the model village became too big to fit out of the doors of the hall, and so it stayed there and will continue to as long as there are visitors to come and see it. Aitcheson and her group used a number of techniques to create the different textures.